The last morning on the Colorado River. The water was calm. The few rapids before the helicopter pad were nothing like Crystal or Lava Falls. We were all quiet, no more the screams and roaring laughter over the whitewater rapids. And we remained dry! Our bags were packed ready for the helicopter pick-up. Some of us were looking forward to a hot shower and a warm bed. My eyes were wet as I felt sad leaving this River which had become my home in the past 6 days. It was amazing how I came for an "adventure" and yet felt so at home sleeping on a sandy beach, gazing at the starry skies, listening to the wind and woken up by the brightest of moonshine illuminating the dark cliffs of the Grand Canyon. The overwhelming power and beauty of Nature could be felt everywhere. This is the spot that evoked deeper spirituality in me than any church. What is more convincing of the Almighty (without a name! ), of His eternity than the mighty unknown of the Canyon walls, of His caring love than the soothing support of the River waters? What also moved me, on the other hand, is the spirit of human endeavour associated with the passage on the Colorado River. The journals of Powell's expedition make us realise that our trip today is a comfort adventure made possible by the meticulously thoughtful arrangements of Western River and our excellent guides (Steve Wiley and Lindsay). I feel it is a pity that the Colorado River today has been "tamed" and that no drop of her waters flows to the ocean any more. Progress and technology mean building dams over rivers, which has also been happening on the Yangtze River. Is that an unavoidable continuation of brave endeavour exploring the unknown? Our 2 day stay on the Bar 10 Ranch ( pioneer tradition with modern comfort, highly recommendable!) after the river trip was a good transition back to civilisation. There, I found and bought the original journals of J.W. Powell. 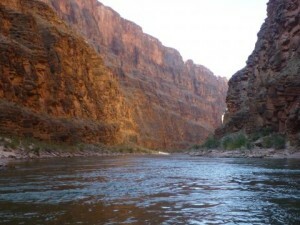 I feel sure that I will come back again to the Grand Canyon and the Colorado River, if time and health allow me. A rim-to-rim hike has long been our wish. The Havasu Falls (which we did not reach this time) and its Indian village strike my fascination. The rest of the Colorado River is still to experience. I had already made my next registration with Steve when we said good-bye. Perhaps we would meet some of our fellow trip mates again in the next adventure. My thanks to all of you for the friendly company, the fun and good times we shared. Let this be not only "once in a life time"!